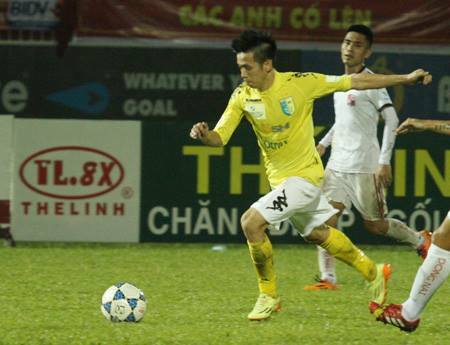 Ha Noi T&T and Binh Duong broke clear at the top of the V League this week. The title chasers recorded wins against Dong nai and Thanh Hoa respectively. Nguyen Van Quyet grabbed a first half hat-trick to inspire Ha Noi T&T to a 3-2 win at Dong Nai stadium. With Samson currently suspended Van Quyet steeped up again to lead the line, taking his personal tally to 9 league goals for the season. Dong Nai hit back in the second half through a brace from Nguyen Hai Anh, but T&T held on to record their 5th win a row. Since their impressive 8-0 demolition of Thanh Hoa , Dong Nai have now lost 5 in a row, slipping to 7th place. I was unable to attend, as I’d made a promise that we’d take a ‘football-free vacation’ this summer. A huge game took place a day later as second placed Binh Duong welcomed third placed Thanh Hoa to the Gò Đậu Stadium. 16,000 fans witnessed the home side cut T&T’s league lead to just 3 points thanks to a first half brace from Nguyen Anh Duc. Thanh Hoa remain third, six points behind Hanoi and having played a game more. World cup fever has taken over the world of football since Brazil kicked off against Croatia, and little to zero attention will be on the VLeague. But, this Tuesday sees surely the clash of the season, as Ha Noi T&T travel to Binh Duong; which promises to be more entertaining than an Italian defensive world cup display (a bitter Englishman! ).